14 pp. Roman, 614 pp. The Dhaasanac are a cattle-keeping people living in the South-West of Ethiopia, stretching into North-West Kenya. Their plain land covers an area of 2.300 km² roughly cut in the middle by the lower course of the Omo river which flows into lake Turkana. Besides their pastoral work they practise a lot of agriculture and even fishing. Dhaasanac, an East Cushitic language, belongs to the Omo-Tana branch whereas the languages of their neighbours are ascribed to the Nilotic phylum. The main purpose of this work is to offer a grammatical description of the language to the linguist. After a presentation of the Dhaasanac phonological system Tosco details the open word classes noun and verb on the one hand and the closed classes as adjectives and adpositions on the other hand. The following chapter is devoted to a survey of Dhaasanac syntax. 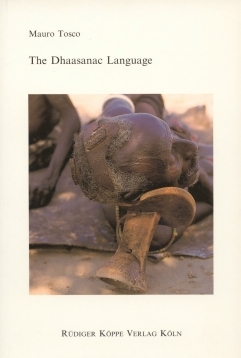 To give the reader an idea of Dhaasanac spoken language the author includes several texts in the appendix: historical oral tradition, a fable, two riddles and others. The texts are furnished with an interlinear and a free translation. Besides a Dhaasanac–English / English–Dhaasanac vocabulary the author prepared several semantic word lists, e.g. geographical and ethnic termini. He gives a detailed presentation of colour categories of Dhaasanac. Please find the introduction of the book following the link below.